2015 was a very successful year for ThinkLite, concluding with a dramatic energy efficient LED retrofit at One Post Office Square, Boston. This project included the building’s parking garage, breezeway between the office building and adjoining Boston Langham Hotel, as well as the massive and impressive lobby, adorned with holiday cheer within its high glass walls and shimmering marble floors. In the garage and breezeway, ThinkLite installed its proprietary LED tubes generating improved light quality, with a projected 65,000-hour lifespan vs. a lifespan of approximately 14,000-hours for a traditional fluorescent tube. Overall wattage consumption was decreased by better than 50%. “Many garage customers as well as tenants commented on how much safer the garage feels with its well-lit environment,” said McGloin. In the lobby, ThinkLite also retrofit several metal halide downlights with its exclusive LED downlight solution. Metal halide is among the most inefficient lighting options available, so by switching to highly efficient ThinkLite LED, energy consumption was decreased by nearly 70%. When asked about ThinkLite’s service and ease of installation, McGloin used one word, “Seamless”. This is impressive given that the lobby retrofit required several special sized lifts being brought through the narrow glass doors and rolling across the fine marble floor. 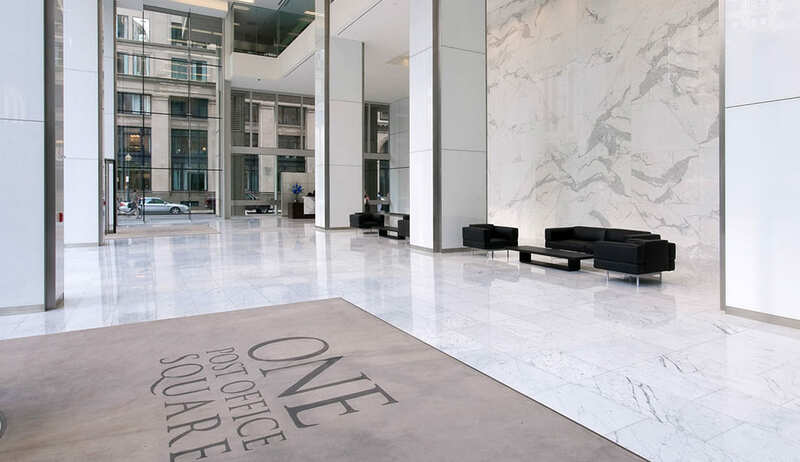 “Our objective was to replace the lamps during off hours, while bringing no harm to the marble floor. We constructed a padded subfloor and secured it with plywood sheets. Installation happened during non-business hours by disassembling one of the revolving doors to the lobby in order to accommodate the lift. At the end of the installation, we simply reversed the order and next morning as workers entered the building, it was as if nothing had happened except that the entire space was now seen in a whole new light!” exclaimed Danny Wadhwani, ThinkLite COO-CFO. Savings projections for One Post Office Square are significant, not only in dollars and cents, but in environmental impact as well. The project is estimated to remove over 415,000 lbs of CO2 per year or the annual equivalent of removing 37 cars from the road.